Birgitte C. Huitfeldt has travelled, met and interviewed ten highly influential women in different Middle Eastern countries throughout a three-year period. In UNCENSORED she tells of her travels and meetings. Egypt, Syria, Turkey, Libya, Palestine, Iran, Jordan, Yemen, Iraq and Saudi Arabia, are all represented by one woman for each country; uncensored and up close. The last three years have given rise to rebellion, war, terror, extremism, turmoil and distress after the Arab Spring in 2011. This book addresses current events and political and social issues that affect women the hardest in this part of the world. What does it mean to us that violence against the woman, and censorship and punishment of her work, scriptures and expressions, is still accepted in the patriarchs of big parts of the Middle East? The ten women who tell us from their point of view, about their experiences and their homeland are different in nationality, background, age and career, but they all have in common that they work for peace, enlightenment, human rights, freedom of expression, gender equality, women’s health and education, and for democracy for all. 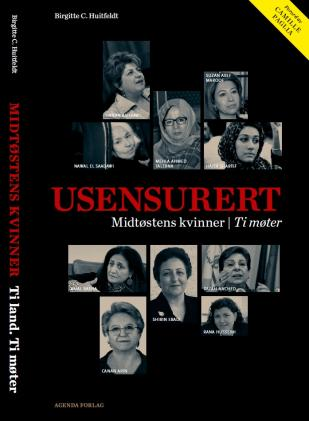 The women in this book are themselves persecuted, punished, threatened and imprisoned for their opinions and their good deeds in their own way; Some live in lifelong exile; but they agree on a common goal of change and growth for the beautiful, but dried, war-torn and overpopulated area we call the Middle East.